Fifty people were killed in the February crash in Clarence Center, New York, near Buffalo. Airline cites crew's "failure to follow ... training and procedures"
Washington (CNN) -- Colgan Air -- under fire for hiring, training, pay and commuting policies after the February crash of Flight 3407 near Buffalo, New York -- is blaming pilot error for the wreck, which killed all 49 people aboard and one person on the ground. In a 67-page report submitted to the National Transportation Safety Board, Colgan blames the captain and first officer, citing a litany of lapses that Colgan said ultimately led to the commuter plane's crash. Colgan said the crew did not respond appropriately to warnings the plane was entering an aerodynamic stall, did not complete checklists and failed to follow "sterile cockpit" rules that prohibit unnecessary conversation during critical phases of flight. Colgan concluded the crash was caused by the crew's "loss of situational awareness and failure to follow Colgan Air training and procedures." After the crash, Colgan said the pilot, Capt. Marvin Renslow, had failed three pilot tests, known as "check-rides," before joining the airline, but had disclosed only one on a job application. He failed another two check-rides while at Colgan Air. In August, Philip Trenary, president and CEO of Pinnacle Airlines, the parent company of Colgan Air, testified at a Senate hearing that while "a failure on a check-ride is not necessarily a reason for someone not to fly, it depends on what kind of failure it is." "The failures that we were unable to see were the basic fundamental failures that you would not want to have," Trenary testified. "Let me stress one thing, Capt. Renslow was a fine man by all accounts," Trenary said in August. But he added, "Had we known what we know now, no, he would not have been in that seat." At the time of the crash, Renslow had 3,379 hours of flight experience -- 172 hours in the Bombardier Dash 8-Q400 turboprop, the type of plane involved in the accident. In Colgan's submission to the NTSB, the company describes its hiring process as rigorous. But, Colgan said, Renslow "was not truthful on his employment application." Renslow did not disclose two of the three proficiency checks he failed, Colgan said. Colgan said it followed federal rules requiring airlines to seek applicants' records, but it was unable to get some of Renslow's information because "Renslow was not employed as a pilot at the time" of his failed check rides. At the time, there was no published guidance on obtaining information from the Federal Aviation Administration, Colgan said. The airline also said Renslow and First Officer Rebecca Shaw did not manage their work schedules properly. While both operated flights out of Newark, New Jersey, Renslow lived in Tampa, Florida, and Shaw lived in Seattle, Washington. During public hearings before the NTSB in May, airline critics said low pay led crew members to live far from their home bases, contributing to fatigue. But Colgan said its pay and commuting policies were not to blame. 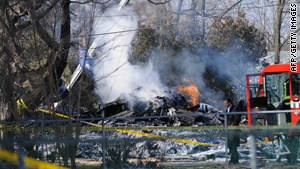 Renslow had 27 hours between flights and Shaw had four days off before the crash, the airline said. "Colgan Air expects its pilots, and all its employees, to present fit for duty, regardless of where they reside," the Colgan report said. Shaw "did not plan her personal time properly prior to reporting to duty," the airline said. "Rather than commuting to [Newark] on February 11 and staying in a hotel, she chose an overnight commute." Shaw earned $26 an hour and was guaranteed 75 hours a month, putting her salary at a minimum of $23,400 a year, Colgan said. But she was on pace to earn "well in excess" of the minimum, the airline said. In a separate submission, the Air Line Pilots Association did not discount the role of the pilots, but said the "fundamental training this crew needed for the situation faced the night of the accident was inadequate." Further, the association said, the Q400 aircraft did not have, nor was it required to have, systems that would have alerted the pilots that the airspeed was abnormally low. The NTSB is investigating the crash. Evidence collected by the NTSB suggests the crew improperly responded to signs the plane was approaching an aerodynamic stall, pulling on the aircraft's control column instead of pushing.